The inaugural Interprofessional Acute Care Simulation, hosted by Samford University’s Experiential Learning and Simulation Center, tested students within the College of Health Sciences to use their knowledge and skills to not only care for their patients but to also work together as an interprofessional health care team. Spaces within the center, which spans 22,000-square-feet within the College of Health Sciences’ facilities, were converted to serve as units within a hospital, including emergency, medical-surgical, operating room, obstetrics, pediatrics, and intensive care units. The three-hour interprofessional education (IPE) simulation was run five times over the course of three days, allowing more than 300 undergraduate and graduate students to participate. These students represented ten programs from within the college’s four schools—School of Health Professions, Ida Moffett School of Nursing, McWhorter School of Pharmacy and School of Public Health. “With the Interprofessional Acute Care Simulation, we have students work through scenarios that are more commonplace in a clinical setting, and we make the different professions—from nurses to physical therapists, health care administrators to pharmacists—work together to provide the best possible care for their patients,” said Jill Pence, executive director of the Experiential Learning and Simulation Center. The simulation used health care manikins in the center’s high-fidelity suite as well as 27 standardized patients, or actors, who served as patients and family members. 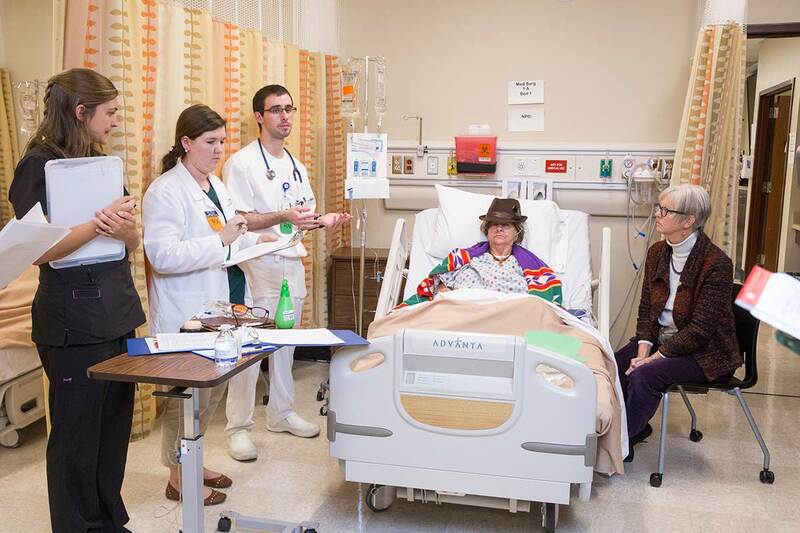 While the Experiential Learning and Simulation Center hosts simulations regularly throughout the academic year, the Acute Care Simulation was the largest simulation to take place within the College of Health Sciences facilities.